Lovage is a multi-use perennial plant that will produce for many years. The leaves and stems can be eaten as a herb, they have a flavour that is a mix of strong celery and parsley and are commonly used to flavour soups and broths. Despite their strong flavour the leaves can be eaten raw in small quantities, a traditional use for the leaves is to chew a segment as a breath freshener. Lovage seeds can be used as a spice, they have a fennel-like flavour that is great for flavouring pickling liquids. Lovage roots can be cooked as a vegetable but contain furanocoumarins which can lead to photosensitivity so it's advisable not to use them. When flowering lovage produces masses of yellow flowers that are held on large upright umbels, these are an irresistible nectar source for the adult stages of beneficial predatory insects such as hoverflies and lacewings. Lovage is native to parts of South-West Asia, it may also be native to parts of Europe although it's disputed if it's actually native there or just naturalised after centuries of cultivation. Lovage grows similarly to celery but is perennial and reaches a much larger size. In cooler climates lovage should be planted in full sun for quickest growth. In warmer climates lovage may suffer from heat-stress in full sun, so plant it in a lightly shaded location instead. Lovage will become leggy if planted in heavy shade. Lovage grows best in a fertile, free-draining, sandy-loam rich in organic matter, if you garden is lacking place down a layer of compost or well-rotted manure prior to planting. Top dress around lovage plants with a complete organic fertiliser if growth is slow or at the first sign of any leaf yellowing or nutrient deficiency. Lovage will die-back during Winter but will re-shoot from the frost-hardy roots in Spring. 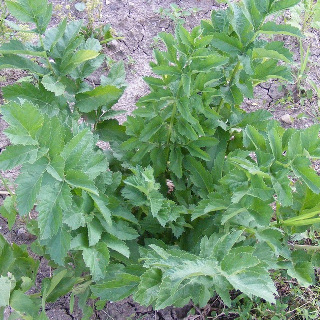 Lovage plants can be propagated by root division during Winter. In warmer climates lovage may not thrive when grown over multiple years as they need Winter dormancy to grow best, however they can still be grown as an annual in warm climates. In cold and mountainous regions of Australia sow lovage seeds from mid Spring to early Summer. In temperate regions of Australia sow lovage seeds from early Spring to mid Summer. In subtropical regions of Australia sow lovage seeds from late Winter to late Spring or during early Autumn. Lovage is unlikely to grow well in the tropics. Sow lovage seeds 6mm deep, sow several seeds per planting hole and thin to the healthiest seedlings after a few weeks growth to ensure optimal seedling vigour. Lovage plants grow large so allow at least 80cm between them to provide their extensive root systems and leaves enough space to spread out. Lovage seeds can have erratic germination, sometimes they will germinate in 10 days but they can take up to 21 days depending on soil temperature. Lovage takes 15 to 17 weeks to grow large enough to start harvesting stems and leaves. Lovage is a perennial and will keep producing for many years.